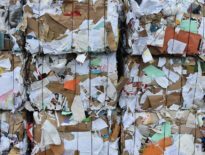 Director of the Waste to Wealth initiative Neil Seldman explains why U.S. recycling will survive despite media narratives that claim the end of recycling is near. Neil and co-author Peter Anderson detail how the recycling industry can adjust and thrive given new circumstances. The Atlantic and The New York Times recently carried near identical stories about what they portrayed as the “end of recycling” due to China’s ban on scrap imports from the U.S. They outlined how this sent the price of recycling soaring, causing some cities to begin cutting down or even eliminating programs and sending materials to incinerators or landfills.